Regardless if the front of your neighborhood has a "no solicitors" sign, you can still expect that there will be some brazen door-to-door salespeople that will test the limits. With the holiday season just a few short months away, this happens to be the time of year when solicitors are out in full force. 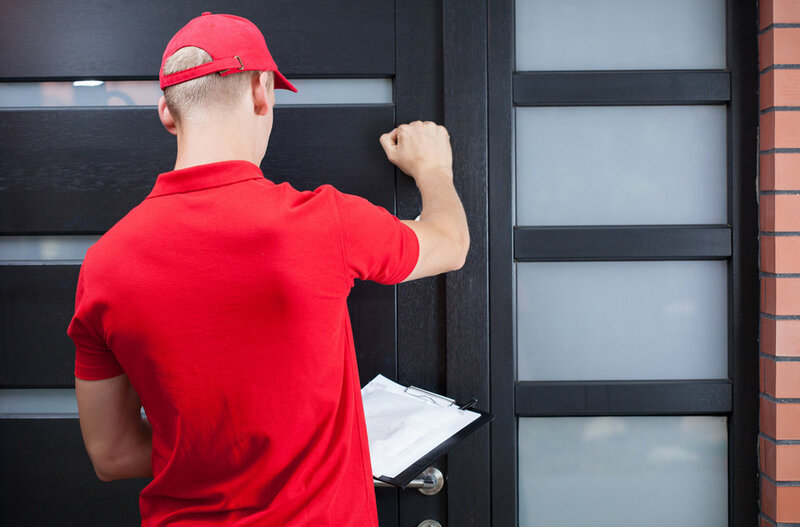 While certainly not all door-to-door salespeople are bad news, you should still be extra cautious when dealing with any stranger that lands on your doorstep and keep home security top of mind. 1. Never open the door to someone that you don't know. This is one of the most basic home security guidelines that you should always follow. By not opening the door, you won't be giving the stranger easy access to your household or any inhabitants inside. If you have an active neighborhood watch program in your community, recommend that no one open doors to solicitors. If your entire neighborhood practices this, salespeople would have no reason to solicit in your neighborhood. 2. Always look through the peephole (or camera) to see who is at the door. Under no circumstances should you ever open your front door before looking through the peephole to see who is there. This is an excellent home security best practice to teach your children as well. Depending on the home security system that you have in your home, having a camera installed at the front door can allow you to view any prospective callers before you decide to answer the front door. A home security camera can also be a very effective deterrent for burglars or anyone with a hidden agenda. 3. Do not get into a conversation with solicitors through your front door. If a door-to-door salesperson is aggressive enough to knock on your door despite the "no soliciting" sign, he or she will likely try anything to get a conversation started. If you take part in the conversation (even through the door), you're encouraging the salesperson to stay. Instead, saying "no thank you" and walking away will send the right message. 4. If you're outside, do not let a solicitor approach you. It's much easier for a solicitor to start a conversation with a homeowner if both parties are outside. Instead of engaging in conversation with the solicitor and encouraging him or her to follow you inside, just say "no thank you" as the solicitor approaches your house and walk inside. Don't forget to lock the door behind you. This will send a clear message to the solicitor that you're not interested in what he or she is selling. 5. Watch where a solicitor heads next after knocking on your door. If you notice that the solicitor seems to be doing anything suspicious such as looking in windows, testing doors, entering backyards, or any other suspicious behavior, call the police immediately. Working together as a community is the best way to enhance home security and reduce the risk of solicitor-related crime. Be sure to talk to your family about home security guidelines that your household plans to follow, especially with the influx of solicitors in neighborhoods this time of year. Use these 5 home security tips as best practices for dealing with solicitors.